Earth-based telescopic image Lunar Orbiter image . Sinus Iridium is the remains of a 260 km diameter walled plain in the NW quadrant. Its northern and western ramparts are well preserved and are called Montes Jura, the large crater Bianchini is situated about halfway along this mountain range. The eastern and western ends of the Jura Mountains terminate with the "capes" Promontorium Leplace and Promontorium Heraclides respectively. 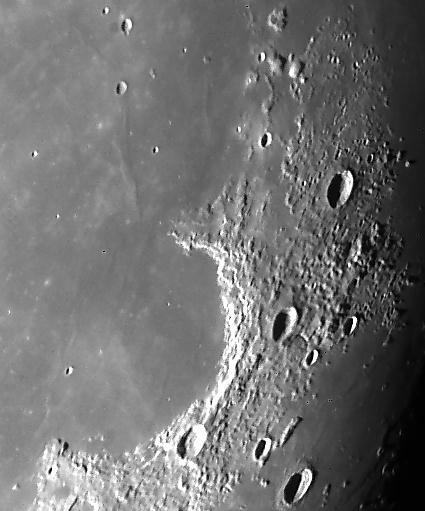 The interior of Sinus Iridium is flooded with mare material on which there are several wrinkle ridges and small craters. There are several medium res orbiter images, but only one hi-res. And since the area is extensive only the full sized orbiter image shows the detail.